The Division of Fish and Wildlife is currently maintaining 17 reef sites in the ocean along the New Jersey coast as part of the Artificial Reef Program. 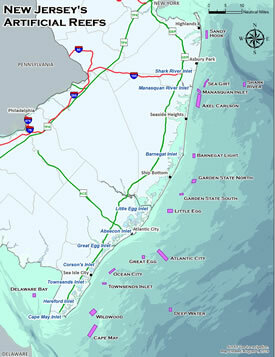 These sites are located between 2 and 25 nautical miles offshore from Sandy Hook to Cape May. Reefs are constructed by intentionally placing very heavy structures, such as old ships, concrete debris, rock, obsolete army tanks and prefabricated concrete artificial reef units on the sea floor. The structures are placed within areas designated as reef sites by the U.S. Army Corps of Engineers. Reef sites should be avoided by operations using equipment on the sea floor, such as commercial trawl, net and dredge fisheries, cable or pipeline projects and sand or mineral mining projects. Reef structures may impede, entangle or destroy sea floor equipment and endanger operators. The use of heavy equipment on reef sites may cause damage to and move reef structures as well. Structures dragged outside reef boundaries by commercial fishing gear or other activities become unknown, uncharted hazards to all sea floor operations. This notice applies to all of New Jerseys 15 reef sites. All of the reef sites have been plotted as "Fish Havens" on current NOAA nautical charts. Fish havens (reef sites) are delineated as blue-shaded areas on NOAA nautical charts. Please retain this notice on your vessel and refer to appropriate nautical charts to identify the location of reefs in the area of ocean you are working. NOTE: Some charts have information about species typically found on the reefs; these are noted below. 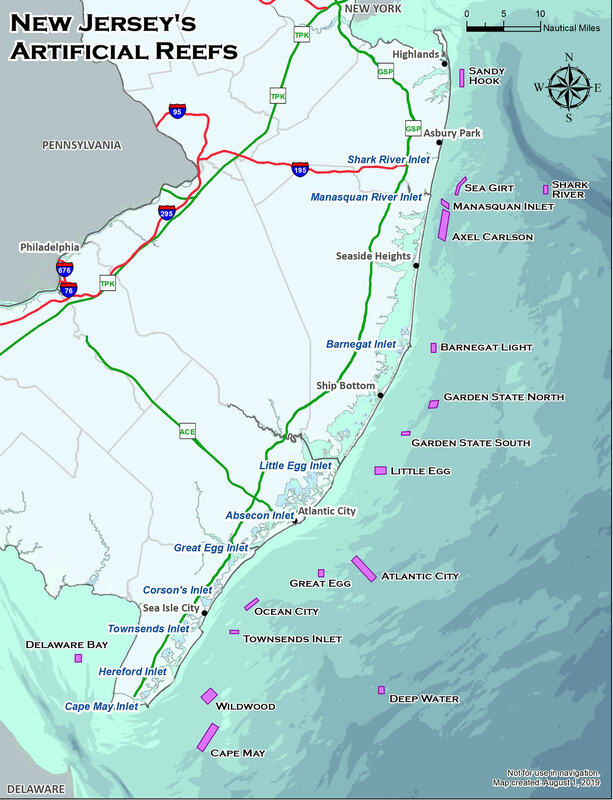 Del-Jerseyland Inshore (pdf, 175kb) Reef coordinates in Digital Global Positioning System (DGPS) using dd.mm.mmm (degrees, minutes and thousandths of minutes) are available in PDF format. Coordinates in the traditional dd.mm.ss (degrees, minutes, seconds) format and LORAN C are available by calling 609-748-2020.